Who says Whole30 has to be filled with boring dinners? I’m all in for flavor and healthy. So how does chili dogs apply to that? One big and flavor packed way. Applegate makes Whole30 compliant hot dogs. I happened to be at Whole Foods (shopping for Amazon discounts) when I spotted them. So I made the classic chili recipe from the Whole30 book, and Whole30 chili dogs were born. And we weren’t sad about it. Only thing not pictured in the photo was a squiggle of mustard. It was a favorite of ours. And it will happen again soon. The key to being successful with Whole30 is to prepare. If you don’t prepare, you will have a terrible experience. Don’t get me wrong, you can still do it and be successful, but you will stress about preparing food on the fly. Trust me. I’ve been there. Part of my meal prep and planning success happens because I always try to make enough dinner for lunch the next day. After my first Whole30, I realized I need to double my dinner so we could eat it for lunch. Whole30 lunches are the toughest thing to prepare. We live off sandwiches or wraps for lunch, but I know bread isn’t the best for my tummy so I try to limit it as much as possible. This round of Whole30 I am trying to simplify even more. That’s where my trusty Crockpot comes into play. I love the convenience of the Crockpot, but I usually forget I have one. But I woke up Sunday morning feeling extremely terrible. Had a bout with my reactive hypoglycemia, and worked through my low blood sugar issues with a fresh peach and a little bit of scrambled eggs. Cooking was the last thing I wanted to do. So I ventured into the depths of my cabinet for the Crockpot. I knew I had the makings for a delicious Vegetable Beef Soup, and the goal was to throw everything into the Crockpot so we could eat a nice, hot dinner. (And I was off the hook for standing over a hot stove/thinking up what to make). Brown the hamburger meat in a skillet. Season with salt, pepper and Italian Seasoning. Once the hamburger meat is brown, throw all ingredients into the Crockpot. Turn it on high and cook for six hours. Check the seasonings, and add more salt, pepper and Italian seasoning, if needed. We both really enjoyed this hearty soup. It’s full of simple ingredients, but it doesn’t lack in flavor. You can add whatever veggies you have on hand, and I bet it will be just as delicious. I love the ease of using a crockpot to prepare meals. Talk about a time saver. Just set it and forget it. 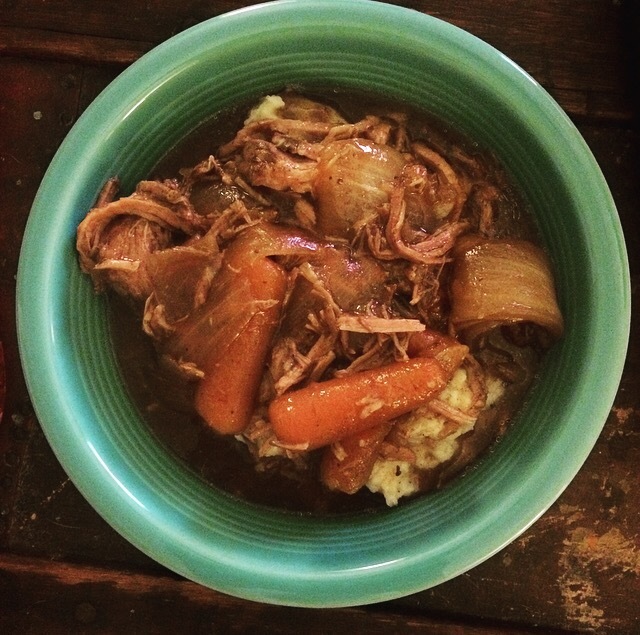 Yesterday morning I put a roast in the crockpot with baby carrots and chunks of onion. When I got home last night, the roast was so tender it fell apart, and the carrots and onion were caramelized. So I whipped up a batch of mashed baby red potatoes with a little Kerrygold butter and a splash of heavy whipping cream. Too much goodness in this bowl. And so easy. Start by seasoning the roast with salt and pepper. Seer it in a hot pan until a crust forms on all the sides. Deglaze the pan with red wine. Put roast and all the wine from the pan in the crockpot. Add in the onion soup mix, carrots, onions and beef consume. Turn crockpot on to low and cook for 8-10 hours. For the mashed potatoes, cut up the baby red potatoes into chunks. Leave the skin on. Boil for 20 minutes or until the potatoes are fork tender. Drain off excess water. Return potatoes back to warm pan. Add in a generous pat of butter and a splash of whipping cream. Mash them up. Add salt and pepper to taste. I usually add a little more butter and cream to make the potatoes extra tasty. Layer the potatoes with the roast, carrots and onion. Be sure to spoon over lots of the juice because it has all the flavor goodness. So easy. Super delicious. Always a crowd pleaser.